Jungle is a ground forces map available in all modes. It is one of the oldest tank maps, being present in the ground forces Closed Beta Test (CBT), and being released with the ground forces Open Beta Test (OBT) in Update 1.41. The map takes place on the coast of a tropical island, with palm trees and other tropical vegetation. 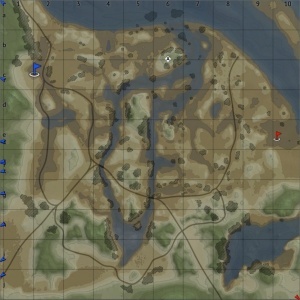 The north of the map is a beach area, with natural dips, sand dunes, and small rocky hills to provide cover from enemy tanks. Water flows into the centre of the map, creating an island in the middle, through a break in the beach. The east and west areas of the have reasonably thick vegetation and are quite uneven, providing plenty of opportunities to hide from enemy tanks, and set up ambushes. The Island in the middle of the map is separated from the rest of the map by shallow water, not deep enough to down most tanks. Again it has plenty of vegetation and uneven terrain, providing cover in the middle area of the island. There are hills at the north and south tips of the island. The northern hill allows players to shoot down on players in and approaching, the south of the island. 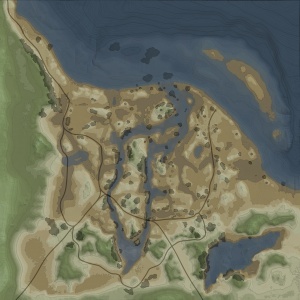 It also allows the player too shot onto the beaches and other areas in the north of the map. Rocks provide cover from the east and west, but the player is still exposed to fire from the north and south. A road passes along the south edge of the island, with two bridges linking the island to the east and west of the map. If not careful players can fall off these bridges, often leading to them falling upside down into the water and drowning, unless a teammate is in the area and acts very quickly to right the tank. The south hill can be a useful strategic position, allowing you to engage enemy tanks in the south of the map, but can leave players exposed to fire. Hills in the east and west of the map are often used by players to shoot enemy tanks in the vicinity of the southern hill. The south of the map has a couple of big hills on the east and west players can climb to get a commanding view of the south and middle of the map. The area between the hills is flatter and more open, but still has plenty of vegetation. Players use this area to shoot at enemies on the south of the island, and try to advance towards the other teams spawn. The ground forces area is 1.6km x 1.6km and the air forces map is 65km x 65km. The map is called Guadalcanal in the game files, and in air battles, the Guadalcanal mini-map is used, showing the tank battles area to be located on the northeast coast of Guadalcanal, in the Solomon Islands. Although the tank battles area is clearly inspired by the terrain of the area it is in real life (in the vicinity of 9°16'44.3"S 159°44'26.0"E), the layout appears to be fictional. The Guadalcanal Campaign, also known as the Battle of Guadalcanal, under the codename Operation Watchtower was fought between 7 August 1942 and 9 February 1943 on and around the island of Guadalcanal in the Pacific theatre of World War II. It was the first major offensive by Allied forces against the Empire of Japan. Allied forces, made up predominantly of United States Marines, landed on Guadalcanal, Tulagi, and Florida in the southern Solomon Islands, on the 7 August 1942. Their aim was to capture the islands, preventing Japanese forces from using them to disrupt Allied supply and communication routes between the US, Australia, and New Zealand. The Allies also wanted to use the islands of Guadalcanal and Tulagi as bases to support a campaign to take over the major Japanese base at Rabaul on New Britain. The Allied forces overwhelmed the outnumbered Japanese defenders (60,000 - 36,000), who had occupied the islands since May 1942. They captured the islands of Tulagi and Florida, as well as an airfield (later named Henderson Field) that was under construction on Guadalcanal. Surprised by the Allied offensive, the Japanese made several attempts to recapture Henderson Field between August and November 1942. There were three major land battles, seven large naval battles, and continual (almost daily) aerial battles. This culminated in the decisive Naval Battle of Guadalcanal in early November, in which the last Japanese attempt to bombard Henderson Field from the sea and land with enough troops to retake it was defeated. In December, the Japanese abandoned their efforts to retake Guadalcanal and on the 14 January, 1943 launched Operation Ke, their withdrawal from the Island. It lasted until 7 February 1943, ending the Guadalcanal Campaign. There are three Capture Points. Point A is on the southern hill of the centre island, B is on the west of the beach, and C is on a small hill on the east of the beach. There is are three configurations of the conquest mode, each with one Capture Point. The point will either be on the northern beach, on the hill next to the split where water flows in; or it will be on the northern or southern hill, on the centre island. There are two capture points, each owned by one of the teams. Point A is in the jungle area in the west of the map and B is in the jungle area in the east of the map. One capture point will be in the northwest of the map on (the bank opposite the northern hill of the island), and another will be in the jungle in the east of the map (opposite the southern hill on the island). When captured they will unlock a capture point in the middle of the southern and northern halves of the town respectively. When captured these points unlock the final capture zones, located in the north and south of the island, respectively. This page was last edited on 2 April 2019, at 18:18.